Christmas is just around the corner….if you consider 288 days away to be the near future. 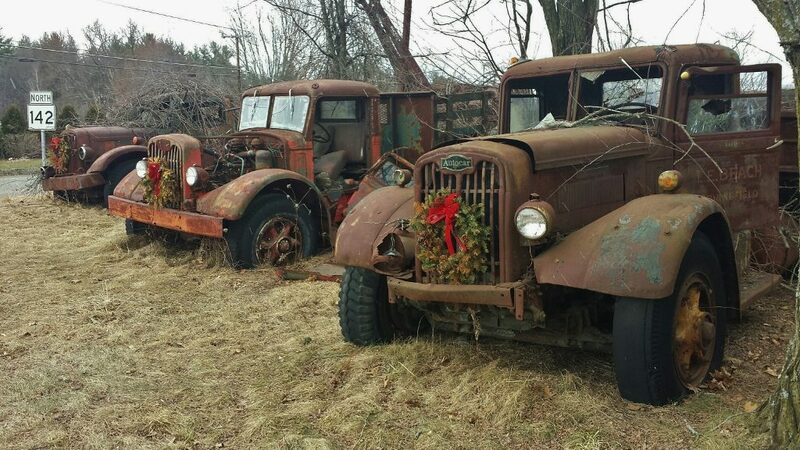 Hugh was about and about recently when he came across this trio of Autocar Trucks still dressed for the holiday season. These trucks hail from the 40’s if my guess is correct. Most likely they are gas powered. Little else is know about their history other than the faded lettering that reads L.E. Beach, Springfield (MA presumably). Thanks for making the u-turn Hugh! This entry was posted in Autocar Trucks and tagged autocar, l.e. beach. Bookmark the permalink.